Standard Telephones and Cables Ltd. (STC) was yet another great British electrical manufacturer with a long and distinguished history that could not make the transition to the world of modern electronics and vanished in the early 1990's. Although it was, to all intents and purposes, a British company, it was in fact founded as part of Western Electric, and owned by ITT for most of its life. 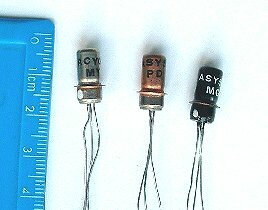 STC's main germanium semiconductor product lines were the TK, ACY and ASY series of germanium transistors. They made few power transistors. Their devices usually bear the STC logo, the type number in capitals e.g. ACY34, and often a two-letter code which I do not know how to decode , or even whether it is a date code or something else. If you can help, please contact me. STC made many more modern types of devices than I show here. In particular they manufactured silicon transistors, hybrid integrated circuits, and even some monolithic ICs based on tunnel diodes. The situation is confused by the relationship with the parent ITT, so if you have information about any of their semiconductors, please share it with me. Conversely, I am happy to help anyone looking for information on these devices. I have an extensive collection of original data sheets and books, and can provide characteristic data on almost all early STC types. Certainly amongst the first STC types were the 3X/100N and 3X/101N point-contact switching prototypes, for which I have data sheets dated 1953. Coblenz and Owens book from 1955, one of the very first publications on transistors, shows an unidentified STC device that the authors state was made in 1949. 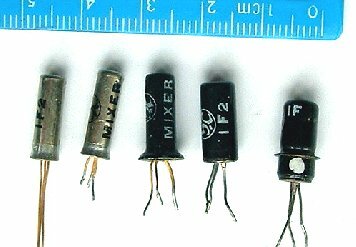 These transistors are characteristic of early point-contact types in that the base lead emerges from the opposite end of the cylindrical can from the emitter and collector. This is because the base wire is attached to one side of the germanium die, and the collector and emitter point-contacts press upon the other. Both types use a long cylindrical steel can, with a serial number crudely etched into the metal. The 3X/100N has its part number hand-painted in white, the 3X101N has no other identification on the body, but the part number can be determined by the colour of the short sleeves on the emitter and collector leads: black+black for 3X/100N and black+brown for 3X/101N. 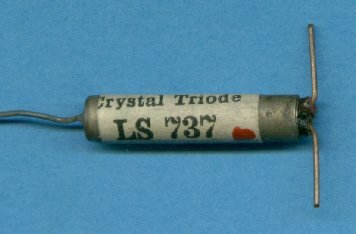 Two point-contact transistors were sold commercially by STC, the TP1 and TP2 from 1955. The image shows a TP2 in its original box, using STC's "Brimar" branding. A small label on the box indicates that this device was sold at Lasky's shop in Tottenham Court Road, London. 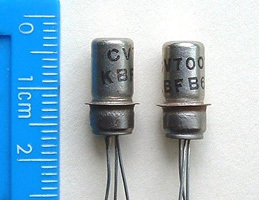 These transistors are identified in STC's data book, the "Brimar Valve Manual", although unfortunately this annual publication rarely bore a printed date. 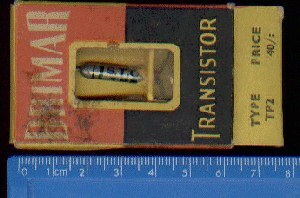 This image shows a 3X/300N transistor that has been cut in half and mounted in acrylic (which has gone rather yellow with age). 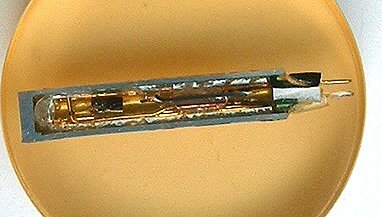 The germanium die is the tiny black rectangle to which the wires attach. It is also evident that device was prevented from shorting out on the aluminium can by the use of an internal glass tube, sealed at one end. 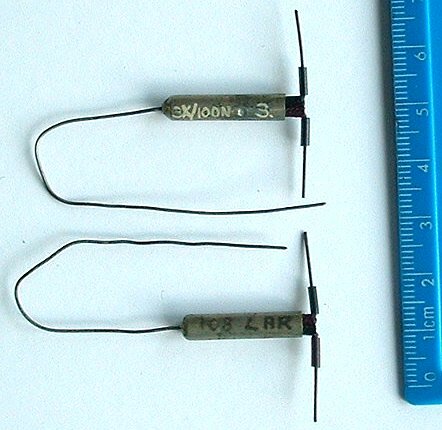 These devices, types TJ1 to TJ3, are STC's first commercial junction transistors, and are presumably production versions of the 3X/300 types above. They date from 1956 and are described in the "Brimar Valve Manual". 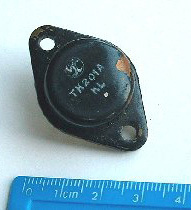 These types can sometimes be found in Brimar boxes such as that shown for the TP2 above. 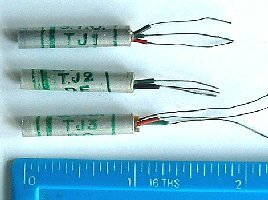 The types TJ1 to TJ3 did not last long, they were almost immediately replaced by TS1 to TS3, which used an improved and smaller metal can, albeit with lower power dissipation of 50 milliWatts compared with 200 mW for the TJ types. The series went on to TS18: early examples have green or red printing on bare metal, later ones are painted black with white lettering. Rarely, these types can be found in Brimar boxes such as that shown for the TP2 above. Unmarked examples from this series, presumably out-of-spec devices, were sometimes sold cheaply to the amateur electronics market as 'white-spot' transistors. 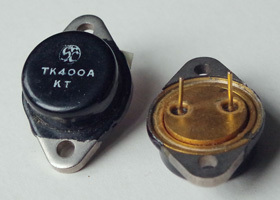 The TK series from about 1959 was STC's first serious production range of transistors, covering all kinds of applications from AF to RF and switching. A number of the devices in the series had multiple suffixes, such as A, B, C (presumably gain selection) and even CA. The series used a metal can that STC denominated as KO-5, although other data books sometimes call it SO-2. It usually had a circular flange (joint?) around the middle, but as the TK20B in the image shows, this was not always the case. Often the transistors were painted black, but again this was not always the case, and some were grey metal while some were copper coloured. 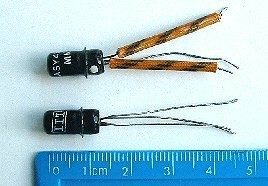 STC appear to have made rather few power transistors, and all use the TO-3 'diamond' package, which STC designated as KO-12. 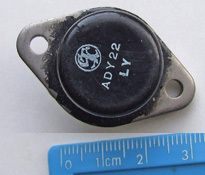 There are germanium ones in the ADY series, my image shows ADY22; there are also similar ADY23 and ADY24, which I would like to obtain, and also ADY25. There are more germanium ones in the proprietary TK series, TK400A to TK403A. I'm interested in obtaining TK401A to TK403A. 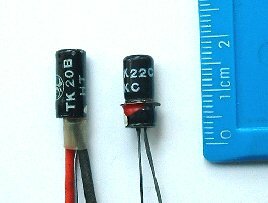 There are also silicon power types in the TK series, namely TK200A to TK202A. It's somewhat puzzling that these are lower-numbered than the germanium TK set. STC changed from using their proprietary TK series, and went on to produce germanium transistors using the standard prefixes ACY and ASY. The image shows the different appearances possible: black painted, copper-coloured, or grey metallic. During one period STC produced sets of devices just marked MIXER, IF, OP, DR for driver etc for manufacturers of superhet LONG/MW transistor radios. Because STC was in fact owned by ITT, it is possible to find devices from their series marked as ITT. The image shows an ASY55. 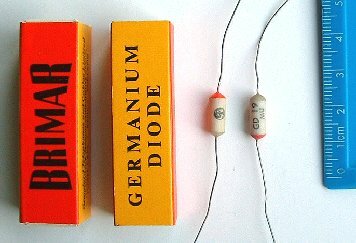 STC manufactured an early range of low-power germanium diodes with the prefix GD, under the Brimar brand. 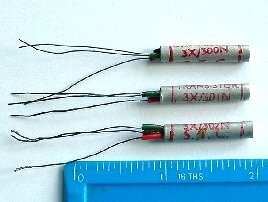 The JK series in the KO-5 can shown above, which contained oddities such as tunnel diodes and 'backwards' diodes. Being a major supplier to the UK government, many STC types were included in the military CV series. 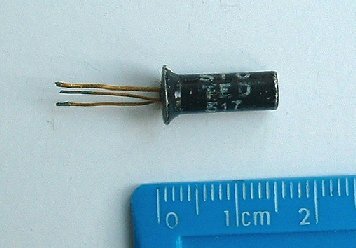 My image shows a CV7001 which is equivalent to a TK23 transistor.